As I have discussed in an earlier post, one of the OSIRIS-REx mission’s top objectives is to understand the Yarkovsky effect. The Yarkovsky effect describes a small force that affects the orbit of asteroids. In the 19th century, Ivan Yarkovsky realized that the infrared radiation escaping from a body warmed by the Sun carries off momentum as well as heat. When an asteroid is warmed by sunlight, it eventually re-radiates the energy away as heat, which creates a tiny thrust. This recoil acceleration can produce substantial changes in the asteroid’s orbit over timescales ranging from many millions to billions of years. 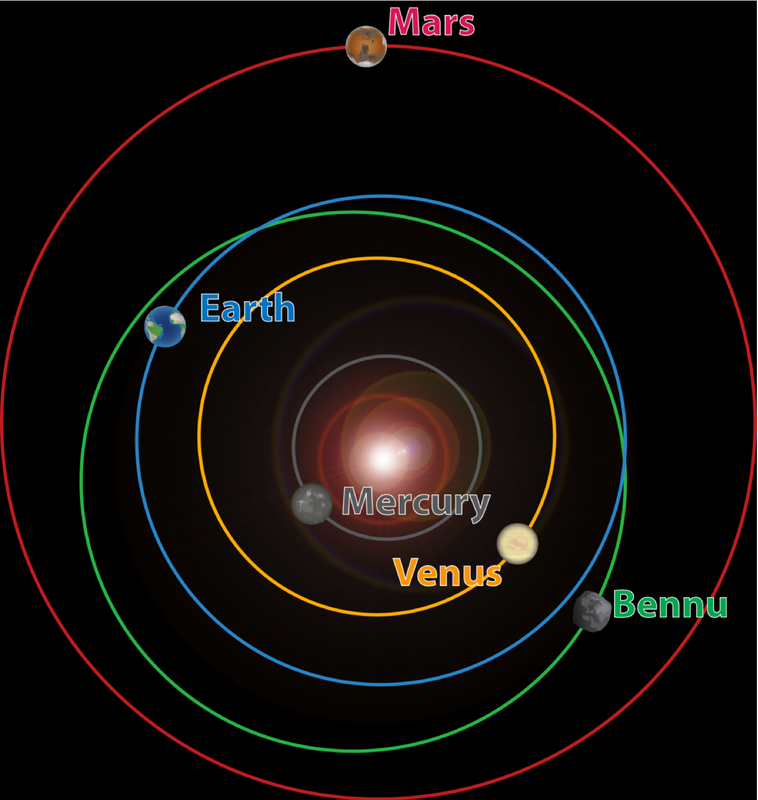 Understanding the Yarkovsky effect on Bennu is essential to predicting its orbit and for determining the probability that it will impact the Earth. The YORP effect is a similar phenomenon that affects the rotation rate and pole orientation of an asteroid. YORP is an acronym that combines four scientist’s names: Yarkovsky, O’Keefe, Radzievskii, and Paddack. Building on the work of Yarkovsky, V. V. Radzievskii showed in 1954 that variations in albedo across the surface of a small body in space could increase its rotation rate. This phenomenon is essentially the Crooke’s radiometer effect. Stephen Paddack and John O’Keefe, who were separately working on the origin of tektites and interplanetary dust, went on to show that an object’s shape strongly influences the change in rotation. David Rubincam synthesized these ideas in 1999, and showed that YORP creates a thermal torque akin to a “windmill” effect on asteroids. This torque can modify the rotation rate and obliquity of an asteroid, depending on the external geometry of the body. In 2007 there was direct observational confirmation of the YORP effect on the small asteroids 2000 PH5 and 1862 Apollo. Asteroid 2000 PH5 was later named 54509 YORP to honor its part in the confirmation of this phenomenon. Since then, study of the YORP effect has revolutionized our understanding of the evolution of asteroids, including Bennu. For example, in 2013 asteroid P/2013 R3 was observed to be breaking apart, likely as a result of an increased spin rate by the YORP effect. This series of images shows the asteroid P/2013 R3 breaking apart, as viewed by the NASA/ESA Hubble Space Telescope in 2013. The YORP effect also plays a central role in the evolution of Bennu. Our proposed history for Bennu suggests that it migrated inward across the inner main belt by Yarkovsky thermal forces over many hundreds of millions of years. We recently modeled the dynamical evolution of small bodies like Bennu from candidate asteroid families in the main belt to Bennu’s current orbit. This turned out to be a surprisingly challenging problem. Small bodies in the main asteroid belt can not be detected by present-day telescopic surveys. We also do not know the thermal properties that Bennu-sized bodies have, and these are needed to tell us how these bodies are affected by the Yarkovsky and YORP effects. At present, the best we can do is infer their properties based on what we know of small asteroids in the near-Earth asteroid population. The biggest problem, however, is that our knowledge of how small asteroids evolve by the Yarkovsky and YORP effects is incomplete. The Yarkovsky and YORP effects played an important role in the history of Bennu. For this recent study, we tracked the orbits of virtual Bennu-like asteroids evolving by coupled Yarkovsky/YORP effects, incorporating a new formalism for how YORP torques modify the spin vector of small asteroids. We assumed that shape changes to asteroids, produced by a variety of processes such as crater formation, caused the asteroids’ spin rates to change in a random way. This ‘‘stochastic YORP’’ mechanism slows down how often asteroids either spin up so fast that they shed mass or spin down so much that they begin to tumble. The coupled Yarkovsky and YORP effects likely modified Bennu’s spin axis to a value approaching 180˚, the value it has today. This allowed Bennu to drift inward by the Yarkovsky effect far enough to reach a dynamical resonance capable of pushing it out of the main belt and onto a terrestrial planet-crossing orbit. We found the most likely parent families for Bennu are Eulalia and New Polana. On average, more than twice as many objects from the New Polana family reach Bennu’s orbit as those from the Eulalia family. This corresponds to the New Polana and Eulalia families having a 70% and a 30% probability of producing Bennu, respectively. The current shape and rotation state of Bennu are likely also the result of the YORP effect. The spinning-top shape of Bennu is shared by many objects in the near-Earth population, such as (66391) 1999 KW4, (311066) 2004 DC, (341843) 2008 EV5, and (136617) 1994 CC. These shapes are thought to result from a rubble-pile’s response to YORP torques. Modification of rubble-pile asteroids occurs when rotational angular momentum is added or subtracted to the body causing blocks and particles to move in response to the resulting centrifugal forces. Thus, YORP may add enough angular momentum to produce downslope movement, mass shedding, and shape changes. In addition to establishing the spinning-top shape, the resulting wide-scale resurfacing may have brought fresh, unweathered material to Bennu’s surface. The “spinning top” shape of Bennu is seen in many near-Earth asteroids, such as 1999 KW4 – shown here. 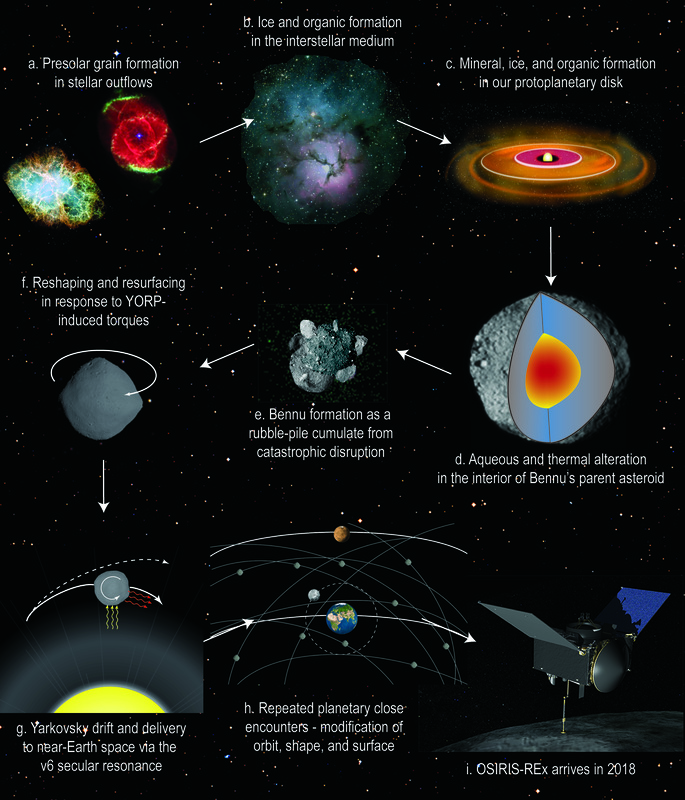 Recent work provides some evidence of YORP-driven evolution of Bennu. Rick Binzel and Francesca DeMeo detected variations in the spectral slope as a function of latitude on the asteroid surface. These data are consistent with a gradient from pole to equator in composition or grain size. From multiple observations at different aspect angles, they detect a slight but reliable spectral-slope difference between the polar and equatorial regions of Bennu. While observational effects are not yet ruled out as the cause for some differences in slope, if real they could be interpreted as compositional or grain-size effects. Such latitudinal spectral variations are consistent with regolith migration driven by YORP-induced spin up. OSIRIS-REx will provide the first ground-truth assessment of the Yarkovsky and YORP effects as they relate to the chemical nature and dynamical state of an individual asteroid. During encounter, precision tracking of the OSIRIS-REx spacecraft, in combination with modeling of the spacecraft motion relative to Bennu, will provide the most accurate determination of the Yarkovsky effect ever accomplished. Detailed measurement of the rotation state during the encounter, compared to the period determined from ground-based lightcurve measurements, will allow us to detect the YORP effect to within 1/1000th of a degree per day per year. OSIRIS-REx will also develop a comprehensive thermophysical model of the asteroid using data obtained during the asteroid encounter. Comparison of the Yarkovsky and YORP effects predicted from this first-principles approach to the direct measurement of the resulting asteroid acceleration and change in rotation state will test our understanding of these phenomena and lead to a substantial improvement in our knowledge of the fundamental parameters that give rise to these effects. Finally, the thermal conductivity and heat capacity of the returned samples will be directly measured in the laboratory. These fundamental physical parameters, combined with the state of the regolith on the asteroid surface, drive the thermal inertia and the resulting strength of the YORP and Yarkovsky effects. Thus, OSIRIS-REx will benefit future studies of near-Earth objects as well as main-belt asteroids in many different ways.